Bush said Saddam had placed troops and equipment in civilian areas in "a final atrocity against his people." WASHINGTON (CNN) -- President George W. Bush told the world Wednesday night that the United States and its allies had launched a campaign to oust Saddam Hussein from Iraq and "free its people." Bush warned the nation that the conflict "could be longer and more difficult than some predict." But he assured Americans that "this will not be a campaign of half-measures, and we will accept no outcome except victory." 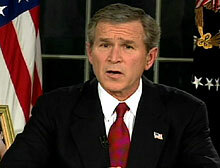 Bush's address marked the second time the president has faced the nation with news that the United States is at war. Bush said that "coalition forces will make every effort to spare innocent civilians from harm." But Bush warned that that goal may not be simple to reach. "Saddam Hussein has placed Iraqi troops and equipment in civilian areas, attempting to use innocent men, women and children as shields for his own military; a final atrocity against his people," Bush said. Earlier in the evening, a Pentagon official told CNN that cruise missiles were being fired against "a target of opportunity" -- a "decapitation attack" aimed at killing Saddam before the planned start of the war. 9:45: White House press secretary states "opening stages of disarmament ... have begun"
Air raid sirens were heard in Baghdad at about 5:30 a.m. Thursday (9:30 p.m. Wednesday EST) about 90 minutes after the U.S. deadline for Saddam to step down or face a U.S.-led military attack. At 10:15 p.m. EST, the president spoke from the Oval Office for just over four minutes. Less than half an hour before Bush's address, White House spokesman Ari Fleischer announced that the president would speak on short notice. He said Wednesday night's actions were only the beginning of a "broad and concerted" military campaign to oust the Iraqi president and his regime. "American and coalition forces are in the early stages of military operations to disarm Iraq, to free its people and to defend the world from grave danger," Bush said. Bush said the United States has Iraq's best interest in mind as the invasion begins. "We come to Iraq with respect for its citizens, for their great civilization and for the religious faiths they practice. We have no ambition in Iraq, except to remove a threat and restore control of that country to its own people," he said. Bush also told Americans that "helping Iraqis achieve a united, stable and free country will require our sustained commitment." In closing, Bush said, "We will pass through this time of peril and carry on the work of peace. We will defend our freedom. We will bring freedom to others. And we will prevail. May God bless our country and all who defend her."